While the number of female police recruits on each Police Academy course is historically underrepresented, they certainly make up for it on the Dux list. In the last 10 years almost 50% of course Dux students have been women. During the same period most courses have comprised less than 30% women. In 2005, recruits Loretta Ashwood and Tracey Grayson achieved Dux and Runner-Up Dux respectively – the first time both accolades went to women. Over the past 20 years the number of female applicants has more than doubled. The gender balance tipped for the first time in Course 1/2016 with 10 women and nine men graduating. Up until the 1970s it was usual for trainee courses to have only one or two women. The age demographic of recruits has also changed in recent years. During the 1971 to 1982 cadet system, recruits joined Tasmania Police straight out of school as 16–18 year olds. Recent graduates from the Police Academy have ranged in age from 18 to 55 years. A merit-based system for recruitment is working to ensure more diverse representation. The earliest graduation photo held on file is of Course 13, which fully comprised men who graduated in January 1953. 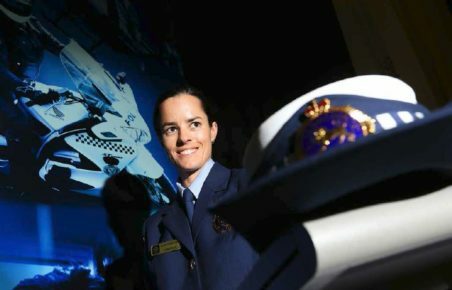 Above: Constable Nikki Mackintosh was Dux of Course 1/2014 (courtesy of The Mercury Newspaper, Hobart). This page -- https://www.police.tas.gov.au/about-us/100-years-women-policing-tasmania-police/recruitment-and-training/women-recruits-top-class/ -- was last published on January 17, 2018 by the Department of Police, Fire and Emergency Management.